The Maserati Quattroporte (Italian pronunciation: [ˌkwattroˈpɔrte]) is a four-door full-size luxury sports saloon produced by Italian automobile manufacturer Maserati. The name translated from Italian literally means "four doors". The car is currently in its sixth generation, with the first generation introduced in 1963. The original Maserati Quattroporte (Tipo AM107) was built between 1963 and 1969. It was a large saloon powered by V8 engines—both firsts for a series production Maserati automobile. The task of styling the Quattroporte was given to Turinese coachbuilder Pietro Frua, who drew inspiration from a special 5000 GT (chassis number 103.060) which he had designed in 1962 for Prince Karim Aga Khan. While the design was by Frua, body construction was carried out by Vignale. The Quattroporte was introduced at the October–November 1963 Turin Motor Show, where a pre-production prototype was on the Maserati stand next to the Mistral coupé. Regular production began in 1964. The Tipo 107 Quattroporte joined two other grand tourers, the Facel Vega and the Lagonda Rapide, capable of traveling at speeds upto 200 km/h (124 mph) on the new motorways in Europe. It was equipped with a 4.1-litre (4,136 cc or 252 cu in) V8 engine, rated at 260 hp (194 kW; 264 PS) DIN at 5,000 rpm, and equipped with either a five-speed ZF manual transmission or a three-speed Borg Warner automatic on request. Maserati claimed a top speed of 230 km/h (143 mph). The car was also exported to the United States, where federal regulations mandated twin round headlamps in place of the single rectangular ones found on European models. Between 1963 and 1966, 230 units were made. In 1966, Maserati revised the Tipo 107, adding the twin headlights already used on the U.S. model. A leaf-sprung solid axle took place of the previous De Dion tube. 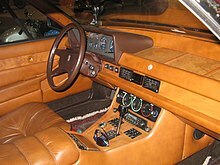 The interior was completely redesigned, including the dashboard which now had a full width wood-trimmed fascia. In 1968 alongside the 4.1-litre a 4.7-litre version became also available (AM107/4700), developing 290 PS (213 kW; 286 hp) DIN. Top speed increased to a claimed 255 km/h (158 mph), making the Quattroporte 4700 the fastest four-door sedan in the world at the time. Around 500 of the second series were made, for a total of 776 Tipo 107 Quattroportes. Production ended in 1969. The first generation of the Quattroporte had a steel unibody structure, complemented by a front subframe. Front suspension was independent, with coil springs and hydraulic dampers. Rear suspension used a coil sprung De Dion tube featuring inboard brakes on the first series, later changed to a more conventional Salisbury leaf sprung solid axle with a single trailing link on the second series. On both axles there were anti-roll bars. Brakes were solid Girling discs all around. A limited slip differential was optional. The long lived quad cam, all-aluminium Maserati V8 engine made its début on the Quattroporte. It featured two chain-driven overhead camshafts per bank, 32 angled valves, hemispherical combustion chambers, inserted cast iron wet cylinder liners, and was fed through an aluminium, water-cooled inlet manifold by four downdraft twin-choke Weber carburetors—initially 38 DCNL 5 and 40 DCNL 5 on 4,200 and 4,700 cars respectively, later changed to 40 DCNF 5 and 42 DCNF 5 starting from December 1968. In 1971, Karim Aga Khan ordered another special one-off based on the Maserati Indy platform. Rory Brown was commissioned as the chief engineer of the project. The car received the 4.9-litre V8 engine (Tipo 107/49), rated at 300 PS (221 kW; 296 hp). Carrozzeria Frua designed the car, the prototype of which was displayed in 1971 and 1972 in Paris and Geneva respectively. 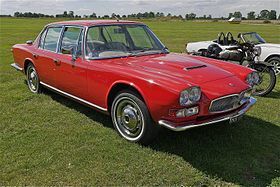 The car was production ready, even receiving its own chassis code (AM 121), but new owner Citroën used their influence to have Maserati develop the SM-based Quattroporte II instead. Only two vehicles were finished, chassis #004 was sold by Maserati to the Aga Khan in 1974, and the prototype #002 went to the King of Spain, who bought the car directly from Frua. The second generation of the Quattroporte, named Maserati Quattroporte II (AM 123), made its world première at the Paris Motor Show held in October 1974, followed by an appearance at the Turin Motor Show. As a result of Citroën's purchase of the Italian company, it was a much different car from its predecessor and its successors: built on an extended Citroën SM chassis, it featured front wheel drive and Citroën's hydropneumatic suspension and swiveling directional headlights. The car had Bertone bodywork, penned by Marcello Gandini. The 1973 oil crisis combined with the collapse of the Citroën/Maserati relationship, made Maserati unable to gain EEC approval for the car. Most of the cars built were sold in the Middle East and in Spain, where such type of approval was not necessary. The front-wheel drive layout and the modest 3.0-litre V6 powerplant based on the Citroën SM engine did not attract customers. Its 210 PS (154 kW; 207 hp) at 5,500 rpm power output was barely enough to propel the 1,600 kg (3,527 lb) car to 200 km/h (124 mph). In 1974, Citroën had Maserati develop a V8 engine. It was essentially based on the 3.0-litre V6 engine used in the Merak with 2.5 cylinders from one block and 1.5 cylinders from another block welded together. This was done to save development costs. An SM was used to test this engine rated at 260 PS (191 kW; 256 hp) - the adjustments needed were modest and transformed the SM into a proper sports car. It was tested in excess of 17,703 km (11,000 mi) at Modena and Monza autodromes and was also in the personal use of Maserati engineer Giulio Alfieri. The bankruptcy of Citroën and Maserati ended the V8's development in 1975. When the marque was acquired by entrepreneur Alejandro De Tomaso, he scrapped the project but the engine was taken out of the test car and stored. The production total amounted to 13 cars only. While the prototype was built in 1974, the succeeding twelve cars were built to order between 1976 and 1978. The nearly stillborn Quattroporte II project was costly for the small company, and the firm reached four billion lire in debt by the end of 1978. The third generation of the Maserati Quattroporte (Tipo AM 330) was developed under the Alejandro de Tomaso-GEPI ownership. After the brief parenthesis of the Citroen-era front-wheel drive Quattroporte II, the third generation went back to the classic formula of rear-wheel drive and a large Maserati V8 engine. The exterior design was penned by Giorgetto Giugiaro. From 1974 to 1976, Giorgetto Giugiaro presented two Italdesign show cars on Maserati platforms, called the Medici I and Medici II. The latter had features that would make it into the production version of the third-generation Quattroporte. A pre-production Quattroporte was introduced to the press by the then Maserati president Alejandro de Tomaso on 1 November 1976, in advance of its début at the Turin Motor Show later that month. It was only three years later though, in 1979, that the production version of the car went on sale. De Tomaso, who disliked Citroën, removed all of the influence of the French marque from the car. The quad-cam V8 engines built from scratch for the Kyalami were used as well as other mechanical parts. The V8 engine prototype in development under development was also scrapped and the staff was also replaced, the most notable being head engineer Giulio Alfieri who was replaced by Aurelio Bertocchi. The hydraulic system of the Quattroporte II was replaced by a conventional power steering setup and the suspension geometry was akin to the Jaguar XJ. Initially, the "4porte" badging was used, but changed in 1981 to Quattroporte. Two versions of the V8 engine were available: a 4,930 cc (4.9 L) version generating a maximum power output of 280 PS (206 kW; 276 hp), and a smaller 4,136 cc (4.1 L) engine generating 255 PS (188 kW; 252 hp)(241 PS (177 kW; 238 hp) in later versions), which was phased out in 1981. The interior was upholstered in leather and trimmed in briar wood. The instrumentation came from the Plymouth Horizon. The Quattroporte III marked the last of the hand-built Italian cars; all exterior joints and seams were filled to give a seamless appearance. From 1987 onwards, the Royale superseded the Quattroporte. The Quattroporte III was an instant success and 120 units were sold in Italy alone. On 14 December 1986, at Maserati's 60th anniversary as a car manufacturer, De Tomaso presented the Maserati Royale in Modena, a built-to-order, ultra-luxury version of the Quattroporte. It featured a higher compression 4.9-litre V8 engine, generating a maximum power output of 300 PS (221 kW; 296 bhp). Besides the usual leather upholstery and veneer trim, the car featured a revised dashboard with an analogue clock, four electrically adjustable seats, retractable veneered tables in the rear doors, and a mini-bar. Visually, the Royale was distinguished by new disc-shaped alloy wheels and silver-coloured side sills. A limited production run of 120 cars was announced, but when production ceased in 1990 only 53 cars were completed. In all, including the Royale, production of the Quattroporte amounted to 2,155 units in total. The Quattroporte III utilised an all-steel unibody structure. The chassis was related to that of the Kyalami, in turn derived from the De Tomaso Longchamp and therefore ultimately related to the De Tomaso Deauville luxury saloon. Front suspension was of the double wishbone type, with single coaxial dampers and coil springs and an anti-roll bar. The rear axle used a peculiar layout very similar to Jaguar independent rear suspension. Each cast aluminium hub carrier was linked to the chassis only by a single lower wishbone, the half shafts doubling as upper control arms, and was sprung by twin coaxial dampers and coil springs units. Rear brakes were mounted inboard, the callipers were bolted directly to the housing of the differential. The entire assembly was supported by a bushing-insulated crossbeam. Initially a Salisbury-type limited slip differential was used; in 1984 it was replaced by a more advanced Gleason-licensed Torsen—or "Sensitork" in Maserati parlance. The engine was an evolution of Maserati's own all-aluminium, quad overhead cam V8, fed by four Weber carburetors. The automatic transmission used was a three-speed Chrysler A727 "Torqueflite" gearbox. The manual gearboxes are ZF S5 five speed units. When leaving the factory all the cars were originally fitted with Pirelli Cinturato 205VR15 tyres (CN72). Milanese coachbuilder Carrozzeria Pavesi outfitted several armoured Quattroportes during the 1980s. One of them, a 1983 Blu Sera example nicknamed Calliope, was notably used by President of the Italian Republic Sandro Pertini as the official state car during his tenure. Autocostruzioni SD of Turinese coachbuilder Salvatore Diomante also offered a 65 cm longer limousine version, fully equipped with white leather, "abundant burr walnut", mini-bar, video cassette player and many other necessities. The price of the Diomante limousine at its introduction in 1986 was 210 million lire. The fourth generation of the Quattroporte (Tipo AM337) was manufactured from 1994 to 2001 and was the first car to be produced under the Fiat ownership after Alejandro De Tomaso sold his entire holding to the Italian marque in 1993. It was built on an evolved and stretched version of the Biturbo saloon's architecture, and used the twin-turbocharged V6 and later the new AM578 V8 engine from the flagship Shamal flagship grand tourer. For this reason, the car retained very compact exterior dimensions, and is smaller than any of its predecessors and successors. As the designer's signature angular rear wheel arches gave away, the wedge-shaped aerodynamic (Cd=0.31) body was penned by Marcello Gandini. The world première of the fourth generation of the Quattroporte took place at the April 1994 Turin Motor Show and the car went on sale towards the end of the year. Initially the Quattroporte was powered by the twin-turbocharged, 24-valve V6 engines from the Ghibli. For export markets there was a 2.8-litre unit, generating a maximum power output of 284 PS (209 kW; 280 hp) and attaining a claimed top speed of 255 km/h (158 mph). As local taxation strongly penalised cars over two-litre in displacement, Italian buyers were offered a 2.0 L version, which developed a little more power (287 PS or 211 kW) but less torque than the 2.8-litre version; on the home market, the 2.8 was not offered until a year after its introduction. The cabin was fully upholstered in Connolly leather and trimmed in elm burl wood veneer. Weight was also reduced by atleast 300 kg (661 lb) primarily due to the compact Biturbo underpinnings and by the use of a compact powerplant. After having been displayed in December 1995 at the Bologna Motor Show, a 3.2-litre twin-turbocharged V8 Quattroporte was added to the range in 1996: the new AM578 engine, an evolution of the Shamal V8, generated a maximum power output of 335 PS (247 kW; 330 hp). The top speed was claimed to be 270 km/h (168 mph). At the same time, some minor updates were introduced on all models: new eight-spoke alloy wheels and aerodynamic wing mirrors, and seicilindri or ottocilindri (Italian for "six" and "eight-cylinders" respectively) badges on the front fenders, denoting which engine was under the bonnet. As standard, all the three engines were mated to a Getrag 6-speed manual transmission, while 4-speed automatic transmissions were available on request with the 2.8 and 3.2 engines respectively—4HP22 by ZF and a computer-controlled transmission supplied by an Australian firm BTR. In July 1997, Fiat's subsidiary Ferrari acquired a 50% controlling stake in Maserati S.p.A.. Ferrari immediately undertook a renewal of Maserati's dated production facilities, as well as made improvements to the manufacturing methods and quality control. The steps taken by the new parent company resulted in the improved Quattroporte Evoluzione which was introduced at the March 1998 Geneva Motor Show. It featured 400 all-new or modified parts out of a total 800 main components. Powertrains and performance remained unvaried, save for the adoption of the same BTR transmission from the 3.2 V8 for the automatic 2.8 V6 model. The Evoluzione no longer had the oval Maserati clock on the dashboard and had redesigned wing mirrors. Ferrari management decided to drop the 2.0 L V6 from the Evoluzione lineup, when they were offered alongside the new 3200 GT, and so the new cars were distinguished from the earlier models by V6 evoluzione or V8 evoluzione badges on the front fenders. Production of the fourth generation of the Quattroporte ended in May 2001 and 2,400 units were made in total with 730 being the Evoluzione versions. Japanese importer Cornes & Co. ordered a special numbered edition of the Quattroporte for their customers. Cornes Serie Speciale were the last cars built and were limited to only 50 examples. Available in both V6 and V8 Evoluzione variants, all were automatic, as is typical for that market. This special edition is the only Quattroporte to have a Maserati badge inserted into the C-door-pillar. Even though other Evoluziones had the Lassale clock replaced with the Maserati trident, this edition retained the original timepiece. The Quattroporte is a four-door, five-seater saloon with a steel unibody construction. The overall layout remained unchanged from the Biturbo from which the car descended: longitudinal front engine, rear-wheel drive, all-independent suspension with MacPherson struts upfront and trailing arms at the rear. Despite these similarities, the suspension had been re-engineered: rear trailing arms had a tube framework structure like on the Shamal, together with the limited slip differential. These two components were attached to the body via a newly designed tubular subframe. The fifth generation of the Quattroporte (Tipo M139) was unveiled to the world at the Frankfurt Motor Show on 9 September 2003 and made its U.S. première at the 2003 Pebble Beach Concours d'Elegance; production started in 2004. Exterior and interior design was penned by Pininfarina. Built on an entirely new platform, it was 50 cm (19.7 in) longer than its predecessor and sat on a 40 cm (15.7 in) longer wheelbase. The same architecture would later underpin the GranTurismo and GranCabrio coupés and convertibles. Initially it was powered by an evolution of the naturally aspirated dry sump 4.2-litre V8 engine, as used in the Maserati Coupé, with an improved power output of 400 PS (294 kW; 395 hp). Due to its greater weight compared to the Coupé and Spyder, the 0-100 km/h (0–62 mph) acceleration time for the Quattroporte is 5.2 seconds and the top speed is measured at 275 km/h (171 mph). Over 5,000 cars were built in 2006. The Maserati Quattroporte was initially offered in only one configuration, equipped with the DuoSelect transmission. The base Quattroporte DuoSelect was recognizable by its chromed grille with horizontal slats and adaptive Skyhook suspension. 330 mm brake disks with four piston callipers all-around were standard equipment. Maserati put emphasis on personalisation, offering customers a choice of fifteen exterior paint colours, Poltrona Frau leather upholstery in ten hues, contrasting seat piping and stitching and three types of wood inserts. In 2004, American luxury department store Neiman Marcus offered a limited edition of the Quattroporte, only available for order through the retailer's 2004 Christmas Catalog at a price of 125,000 USD. Each of the 60 Neiman Marcus Quattroportes was painted in Bordeaux Ponetevecchio (wine red) exterior colour and featured a chromed mesh-front grill along with side vents and 19-inch ball-polished wheels. The interior was upholstered in ivory Poltrona Frau leather accented with bordeaux piping and mahogany wood trim. At the Frankfurt Motor Show in September 2005, Maserati introduced two different trim levels for the Quattroporte, the Executive GT and Sport GT. 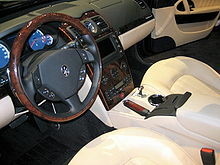 The Quattroporte Executive GT was a comfort and luxury-oriented specification; it came equipped with a wood-rimmed steering wheel, an Alcantara-suede interior roof lining; ventilated, adaptive, massaging rear seats, rear air conditioning controls, veneered retractable rear tables, and curtain shades on the rear windows. The exterior was distinguished by 19 inch eight-spoke ball-polished alloy wheels and chrome mesh front and side grilles. The Quattroporte Sport GT variant offered several performance upgrades: a re-configured transmission providing faster gearshifts and a firmer Skyhook suspension system; courtesy of new software calibrations, seven-spoke 20 inch wheels with low-profile tyres, cross-drilled brake rotors and braided brake lines. Model-specific exterior trim included dark mesh front and side grilles and red accents to the Trident badges, as on vintage racing Maseratis. Inside there were aluminium pedals, a sport steering wheel and carbon fibre in place of the standard wood inserts. A new 6-speed ZF-supplied automatic transmission was presented at the Detroit Motor Show in January, 2007, with the first cars delivered right after the launch, marketed as Maserati Quattroporte Automatica. As all the three trim levels were offered in both DuoSelect and Automatica versions, the lineup grew to six models. The Quattroporte Sport GT S was introduced at the Frankfurt Motor Show in September 2007. Taking further the Sport GT's focus on handling, this version employed Bilstein single-rate dampers in place of the Skyhook adaptive system. Other changes from the Sport GT were a lowered ride height and 10 mm wider 295/30 rear tyres, front Brembo iron/aluminium dual-cast brake rotors and red-painted six piston callipers. The cabin was upholstered in mixed Alcantara and leather, with carbon fibre accents; on the exterior, the door handles were painted in body colour, while the exterior trim, the 20 inch wheels and the exhaust pipes were finished in a "dark chrome" shade. At the 2008 North American International Auto Show, Maserati launched the Quattroporte Collezione Cento, a special edition of the Quattroporte limited to 100 examples. Its unique specification featured an ivory paint colour with a waist coachline, matched to Cuoio tan tufted leather upholstery and Wengé trim inlaid with mother of pearl. Standard equipment comprised most of the available infotainment options. Images of the facelifted Quattroporte appeared on the Internet on 30 January, 2008; the car made its official début at the 2008 Geneva Motor Show. Overseen by Pininfarina, the facelift brought redesigned bumpers, side sills and side mirrors (the latter carried over from GranTurismo), a convex front grille with vertical bars instead of horizontal, new headlights and tail lights with directional bi-xenon main beams and LED turn signals. Inside there was a new navigation and entertainment system. All Quattroporte models now used the ZF automatic transmission, with the DuoSelect being discontinued. The 4.2-litre Quattroporte now came equipped with single-rate damping comfort-tuned suspension and 18 inch wheels. Debuting alongside was the Quattroporte S, powered by a wet-sump 4.7-litre V8 engine, the same engine utilised in the Maserati GranTurismo S, with a maximum power output of 430 PS (316 kW; 424 hp) and maximum torque of 490 N⋅m (361 lb⋅ft). In conjunction with the engine, the braking system was upgraded to cross-drilled discs on both axles and dual-cast 360 mm rotors with six piston callipers at the front. Skyhook active damping suspension and 19 inch V-spoke wheels were standard. Trim differences from the standard 4.2-litre cars were limited to a chrome instead of titanium-coloured front grille. Production of the facelifted Quattroporte started in June 2008. The Quattroporte Sport GT S was premièred at the North American International Auto Show in January 2009. Its 4.7-litre V8 produced a maximum power output of 440 PS (324 kW; 434 hp), ten more than the Quattroporte S, owing to a revised intake and a sport exhaust system with electronically actuated bypass valves. Other mechanical changes were made to the suspension system, where the Sport GT S single-rate dampers took place of the Skyhook system, ride height was further lowered and stiffer springs were adopted. The exterior was distinguished by a specific front grille with concave vertical bars, black headlight bezels, red accents on the Trident badges, the absence of chrome window trim, body colour door handles and black double oval exhaust pipes instead of the quad round exhaust pipes found on other Quattroporte models. On the interior, the veneer trim was replaced by "Titan Tex" composite material and the cabin was upholstered in mixed Alcantara and leather. 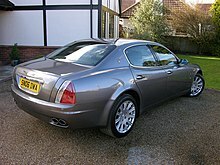 The Quattroporte Centurion Edition was presented in March 2009 for the UK market. It was special version created only for the holders of black American Express cards. The car was painted black and with the Centurion logo on the headrests and instrument panel. The engines available were the standard 4.2-litre and 4.7-litre V8. A special edition of the Quattroporte GT S was introduced at the 2010 Geneva Motor Show: the Quattroporte Sport GT S Awards Edition, celebrating the 56 awards received by the fifth generation of the Quattroporte in just six years since its launch. Its unique specification consisted of "Nero pianoforte" or specially-developed pale gold "Quarzo fuso" pearlescent paint, satin grey wheels, polished brake callipers and all chrome trim in a dark finish. The Quattroporte's body is a steel unibody, with an aluminium boot lid and engine bonnet; the coefficient of drag Cd=0.35. Front and rear aluminium subframes support the whole suspension and drivetrain. A 47%/53% front/rear weight distribution was achieved by setting the engine behind the front axle, inside the wheelbase (front-mid-engine layout) and the adoption of a transaxle layout. With the later automatic transmission - fitted in the conventional position en bloc with the engine - weight distribution changed to 49%/51% front/rear. The suspension system consists of unequal length control arms with forged aluminium arms and hub carriers, coil springs and anti-roll bars on both axles. The DuoSelect electro-actuated transmission available at the launch of the fifth generation of the Quattroporte was a development of the CambioCorsa unit first used in the Maserati Coupé. It was a Ferrari-based semi-automatic transmission, mounted at the rear axle in block with the differential in a transaxle layout, with the twin-plate dry clutch located in a bell housing attached to the rear of the engine. A torque tube joined rigidly together the two units. Gear shifting was done via the standard paddle shifters behind the steering wheel; there was no gear lever on the centre tunnel, but rather a small T-shaped handle used to quickly engage first gear and reverse when maneuvering at slow speed. The 6-speed torque converter automatic transmission was a 6HP26 supplied by ZF Friedrichshafen. Unlike the DuoSelect, it was placed in the conventional position right behind the engine; to accommodate it and the new rear differential the front and rear subframes as well as part of the transmission tunnel had to be redesigned. Manual shifting was possible by the centre-console mounted gear lever; in addition Sport GT cars came equipped with paddle shifters as standard, while on other models they were an optional extra. All Quattroporte models were fitted with a limited slip differential. 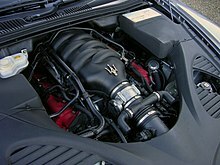 The V8 engines of the fifth generation of the Quattroporte belonged to the "Ferrari-Maserati F136" family; they had aluminium-silicon alloy block and heads, a crossplane crankshaft, four valves per cylinder driven by two overhead camshafts per bank and continuous variable valve timing on the intake side. 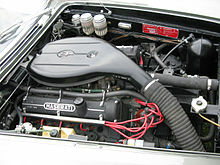 F136S 4.2-litre engines in DuoSelect equipped cars used a dry sump lubrication system; F136UC 4.2-litre engines on automatic cars were converted to use a wet sump oiling system, as did the later 4.7-litre, codenamed F136Y. In 2008, at the Concorso d'Eleganza Villa d'Este, Milanese coachbuilder Carrozzeria Touring Superleggera unveiled the Maserati Bellagio Fastback Touring, a 5-door hatchback built on the chassis of the fifth generation of the Quattroporte. In May 2013 a Bellagio Fastback was auctioned by RM Auctions at their Villa Erba event, in occasion of Concorso d'Eleganza Villa d'Este; the price was €117,600. According to the auction house, four examples have been built by Carrozzeria Touring. In 2009 Swiss Team announced the development of "Maserati Quattroporte EVO" International Superstars Series racing cars based on the 4.2-litre Quattroporte M139, to be piloted by Andrea Chiesa. Swiss Team fielded the cars in the 2009, 2010, 2011 and 2012 seasons; Italian racing driver Andrea Bertolini won the 2011 championship season at the wheel of a Swiss Team Quattroporte. The current sixth-generation of the Quattroporte was introduced in early 2013. With a 3,171 mm (124.8 in) wheelbase it is a considerably larger vehicle than any of its predecessors, to set itself apart from the smaller Ghibli, which shares its underpinnings. Engine choice includes twin-turbocharged V6 and V8 petrol engines, as well as a turbodiesel V6. The new Quattroporte was designed at a special Maserati-only department within the Fiat Group Centro Stile design centre, under the guidance of ex-Pininfarina designer Lorenzo Ramaciotti. Drivetrains, platform, suspension, and body elements such as the front doors are common to the Quattroporte and the smaller Ghibli saloon, which sits on a 173 mm (6.8 in) shorter wheelbase. The Quattroporte is manufactured at the Officine Maserati Grugliasco plant in Grugliasco, near Turin, dedicated to Giovanni Agnelli; this former Bertone plant was acquired by Fiat S.p.A. in 2009 and renovated for production of the two cars. The current-generation of the Quattroporte was unveiled at the North American International Auto Show in Detroit in January 2013. Production started in November 2012. Initially the range included the twin-turbocharged V8 equipped, rear-wheel drive Quattroporte GTS and the entry level Quattroporte equipped with a twin-turbocharged V6 engine; available with Q4 four-wheel drive and rear-wheel drive depending on the market and the choice of the customer. The flagship GTS can be distinguished by its trapezoidal instead of round tail pipes. A V6 turbodiesel model for European markets was introduced in September 2013 at the Frankfurt Motor Show. A total of 100 Quattroporte Zegna Limited editions were produced for worldwide markets in collaboration with Italian fashion house Ermenegildo Zegna. This unique model based on the Quattroporte GTS features unique exterior and interior details including a custom platinum-metallic silk paint scheme with aluminium pigments the exterior of the car along with matching color coordinated 20-inch wheels. On the interior, the seats, panels, roof lining and sunshades are made from specially-milled silk fibers, high performance leather and woolen herringbone fabrics. At the November 2014 Los Angeles Auto Show Maserati introduced the model year 2015 range. The Quattroporte GTS received mild cosmetic updates, such as new multi-spoke forged alloy wheels, colour-matched lower bodywork, and red-accented Maserati logos, while all models were given upgraded standard equipment and ampler trim choice. The Quattroporte uses a mixed steel and aluminium unibody chassis. Front and rear crash structures, the shock towers, the front wings, all four doors, the engine bonnet and the boot lid are made of aluminium. Front suspension uses unequal length wishbones with a forged aluminium upright/hub carrier, and an anti-roll bar; rear suspension is a 5-link, with four aluminium links and a larger, steel fifth lower arm that also serves as a spring seat. A front aluminium subframe supports the engine by two mounting points; the steering rack and the lower suspension arms. A rear subframe, made of steel, houses the differential and supports all of the five suspension links. Unlike the predecessors, the new Quattroporte has frameless doors. The range of two petrol engines. The Quattroporte GTS features a variant of the F154 engine platform shared with the Ferrari 488, the Portofino and other Ferrari models. The engine is a 3.8-litre 90° twin-turbocharged V8, generating a maximum power output of 523 hp (390 kW; 530 PS). The base engine used throughout the trim levels is a 3.0-litre 60° twin-turbocharged V6 generating a maximum power output of 404 hp (301 kW; 410 PS). Both of the engines are designed and assembled by Ferrari. The V8 engine of the Quattroporte GTS differs from the other members of the Ferrari F154 family, in that the Maserati version has a crossplane crankshaft and wet sump lubrication. Turbine housings and exhaust manifolds are integrated in a single piece. The engine also has an overboost function which raises the maximum torque from 650 N⋅m (479 lbf⋅ft) between 2,000 and 4,000 rpm to 710 N⋅m (524 lbf⋅ft) between 2,250 and 3,500 rpm. The V6 engine blocks are cast and machined to Ferrari's specifications respectively in Chrysler's Kokomo, Indiana and Trenton Engine Plant from where they are then shipped to the Ferrari factory in Modena, Italy for assembly. Apart from the gasoline engines, a diesel engine is also available in the Quattroporte lineage, a 271 hp (202 kW; 275 PS) 3.0-litre V6 with a single variable geometry turbocharger, designed and assembled by FCA's subsidiary VM Motori. As of 2018, the Quattroporte S Q4 was upgraded to raise the maximum power to 424 hp (316 kW; 430 PS) from its twin-turbocharged V6 engine. The GTS also received a power upgrade and now generates a maximum power output of 560 hp (418 kW; 568 PS) from its twin-turbocharged V8 engine. The Quattroporte GTS can accelerate from 0–60 mph (97 km/h) in 4.2 seconds and can complete the quarter-mile in 12.7 seconds as evident in Car and Driver's December, 2014 road test. All engines are mated to a ZF-supplied 8HP70 8-speed automatic gearbox, with four-wheel drive available on the V6 in left-hand drive markets only. The V6 four-wheel drive Q4 drivetrain is the same as that in the Ghibli. Attached to the end of the 8-speed transmission is a transfer case, containing an electronically controlled multi-plate wet clutch, which sends power through a drive shaft to an open differential bolted to the oil pan. During normal operation the car is rear-wheel drive only; when needed the system can divert up of 50% of engine torque to the front wheels. ^ a b c "Designer". ajovalo.net. Retrieved 8 February 2012. ^ Cardew, Basil (1966). Daily Express Review of the 1966 Motor Show. London. ^ a b Maserati Quattro Porte AM 107 Mexico AM 112—Uso e manutenzione (Owner's manual), Officine Alfieri Maserati S.p.A.
^ "Quattroporte I (1st Series) - 1963 to 1966". Maserati official site—About us: Heritage. Retrieved 19 April 2015. ^ "Novità e prezzi". La Stampa (in Italian). 30 October 1963. p. 5. Retrieved 19 April 2015. ^ a b Tabucchi 2003, p. 253. ^ a b c d Tabucchi 2003, pp. 288–289. ^ a b Cozza, Ermanno. "Quattroporte II: A brief return with French flavouring!". Enrico's Maserati Pages. Retrieved 28 February 2011. ^ "Frua Maserati Quattroporte 'Aga Kahn' (sic)". coachbuild.com. Atelier Michiel van den Brink. Retrieved 28 February 2011. ^ a b c d e "Maserati Quattroporte II". fastestlaps. Retrieved 9 August 2018. ^ "La Maserati di Bertone". Stampa Sera (in Italian). 2 October 1974. p. 11. Retrieved 8 February 2015. ^ "The lost prototype reborn, the Citroen SM V8". auto trader classics. Retrieved 27 November 2014. ^ Sonnery, Marc (27 September 2010). "1974 Citroën SM V8: A Mystery No More". Autoweek. Retrieved 27 November 2014. ^ a b c Park, Simon (2006-09-13). "Maserati Quattroporte III, 1979-1990". Classic Driver. Retrieved 2019-04-22. ^ "Maserati Sports cars". How Stuff Works. Retrieved 2019-04-22. ^ Bernabò, Ferruccio (2 November 1976). "De Tomaso: come sono riuscito a rimettere in piedi l'Innocenti". La Stampa (in Italian). p. 15. Retrieved 28 January 2015. ^ Rogliatti, Gianni (21 July 1979). ""Quattroporte", grande berlina della Maserati". La Stampa (in Italian). p. 21. Retrieved 28 January 2015. ^ a b c Auto Katalog 1983. Stuttgart: Vereinigte Motor-Verlage GmbH & Co. KG. 1982. pp. 107, 220–221. ^ "Quattroporte III". Maserati. Retrieved 2019-04-22. ^ a b Fenu, Michele (19 December 1986). "De Tomaso punta sulla qualità". La Stampa (in Italian). p. 17. Retrieved 28 January 2015. ^ a b Tabucchi 2003, pp. 292–293. ^ "La ruota che slitta non è più un guaio". La Stampa (in Italian). 6 April 1984. p. 15. Retrieved 28 January 2015. ^ a b c Mella, Dario (November 2015). "Guida all'acquisto: Maserati Quattroporte—Sotto il vestito... Budget". Automobilismo d'Epoca (in Italian). Edisport editoriale S.r.l. 13 (11): 44–57. ^ Romano, Antonio (2013). Tutte le auto dei Presidenti [All of the Presidents' cars] (in Italian). Rome: Gangemi Editore. p. 176. ISBN 88-492-2626-8. ^ a b c Tazelaar, Natan. "Driven: Maserati Quattroporte V6 Evoluzione - Perfect Alternative". DriveTribe. Retrieved 2019-04-22. ^ a b Maserati Quattroporte seicilindri ottocilindri—Uso e manutenzione (Owner's manual) (in Italian). Maserati S.p.A. July 1996. ^ "Quattroporte IV". Maserati. Retrieved 2019-04-22. ^ a b c Tabucchi 2003, pp. 332–335, 357. ^ Park, Simon (2006-10-24). "Maserati Quattroporte IV". Classic Driver. Retrieved 2019-04-22. ^ Rogliatti, Gianni (7 December 1995). "Maserati, lusso e sprint". La Stampa (in Italian). p. 43. Retrieved 5 April 2015. ^ Fenu, Michele (4 March 1998). "Testore: «Una sfida mondiale»". La Stampa (in Italian). p. 15. Retrieved 5 April 2015. ^ "Quattroporte Evoluzione 2.0 problem". bozhdynsky.com. Retrieved 27 August 2018. ^ "Quattroporte Cornes Serie Speciale". bozhdynsky.com. Retrieved 28 August 2018. ^ a b "Maserati Quattroporte". September 2004. Retrieved 26 November 2014. ^ Carr, Jimmy (6 May 2007). "Maserati Quattroporte". driving.timesonline.co.uk. London. Retrieved 8 Jun 2008. ^ "Maserati Quattroporte at Detroit Motor Show". Scoop NZ. 9 January 2007. ^ Loiacono, Salvatore (28 October 2004). "Maserati Quattroporte NM". omniauto.it. Retrieved 29 March 2017. ^ Newton, Richard (19 August 2005). "Maserati Quattroporte GT". automobilemag.com. Archived from the original on 23 September 2015. Retrieved 23 November 2014. ^ "Maserati Quattroporte Automatica Now Shipping". sybarites.org. 13 January 2007. Retrieved 30 September 2010. ^ Aucock, Richard (12 November 2007). "Maserati Quattroporte Sport GT S (2007) CAR review". carmagazine.co.uk. Retrieved 17 November 2014. ^ Siler, Steve (January 2008). "2008 Maserati Quattroporte Collezione Cento". caranddriver.com. Retrieved 23 November 2014. ^ Kurczewski, Nick (14 January 2009). "Riding Out a Recession in Italian Luxury". nytimes.com. Retrieved 16 November 2014. ^ Gall, Jared (February 2010). "2011 Maserati Quattroporte Sport GT S Awards Edition". caranddriver.com. Retrieved 23 November 2014. ^ "Maserati media" (Press release). 6 March 2007. ^ "Villa d'Este 08 Preview: Carrozzeria Touring Maserati Quattroporte Bellagio Fastback". autoblog.com. 22 April 2008. Retrieved 20 November 2014. ^ "2009 Maserati Touring Bellagio Fastback by Touring Superleggera". rmauctions.com. RM Auctions. Retrieved 20 November 2014. ^ Joseph, Noah (13 April 2009). "MSwiss Team takes Maserati Quattroporte to the track in Superstar Series". autoblog.com. Retrieved 26 November 2014. ^ Joseph, Noah (25 October 2011). "Maserati claims title in Superstars Series with Quattroporte Evo". autoblog.com. Retrieved 23 November 2014. ^ "Specifications of new engines - Maserati Quattroporte". autoedizione.com. Retrieved 16 November 2012. ^ Sherman, Don (January 2014). "2014 Maserati Ghibli S Q4". Car and Driver. Retrieved 16 May 2015. ^ Ciferri, Luca (31 January 2013). "Fiat renames Maserati plant after company patriarch". Automotive News Europe. Retrieved 16 May 2015. ^ "Production Maserati Quattroporte 2013 started this week". autoedizione.com. Retrieved 16 November 2012. ^ Sciarra, Fabio (13 September 2013). "Maserati Quattroporte—A Francoforte 2013 arriva il diesel". Quattroruote (in Italian). Retrieved 16 May 2015. ^ "Maserati Quattroporte Limited Edition". Ermenegildo Zegna. Retrieved 16 June 2014. ^ a b Joseph, Noah (12 November 2014). "Maserati updates Quattroporte, Ghibli for 2015 at LA Auto Show". autoblog.com. Retrieved 16 May 2015. ^ Metcalfe, Harry (5 December 2013). "2013 Maserati Quattroporte review". evo.co.uk. Retrieved 19 December 2012. ^ "Maserati: Models: Quattroporte S Q4: Intro". maserati.us. Retrieved 21 July 2014. ^ "Maserati's secret: Chrysler makes its engine blocks". Automotive News. 8 September 2014. Retrieved 14 January 2015. ^ "Maserati 5-year plan" (pdf). fcagroup.com. Retrieved 22 July 2014. ^ "2015 Maserati Quattroporte GTS - Instrumented Test". Retrieved 2015-06-07. ^ Brooks, Glenn (29 April 2014). "Vehicle analysis: Maserati Quattroporte GTS". just-auto.com. Retrieved 3 February 2014. ^ Carey, John (3 March 2014). "Finding traction". Autoweek. 64 (6): 24–27. ISSN 0192-9674. ^ "Live Detroit: Maserati Quattroporte V6 has 410 bhp and Q4-system". autoedizione.com. 13 January 2013. Retrieved 15 February 2015. Tabucchi, Maurizio (2003). Maserati: The Grand Prix, Sports and GT cars model by model, 1926–2003. Milano: Giorgio Nada Editore S.r.l. ISBN 88-7911-260-0. 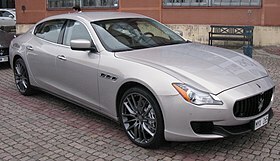 Wikimedia Commons has media related to Maserati Quattroporte.